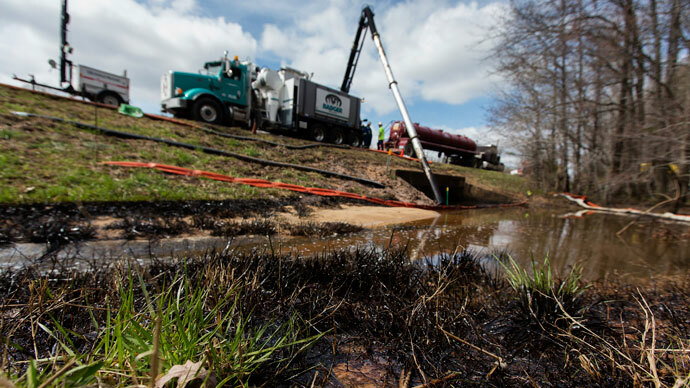 The Exxon oil spill in Mayflower, Arkansas has left many concerned about the state of America’s pipelines, and whether a similar catastrophe is on the way. 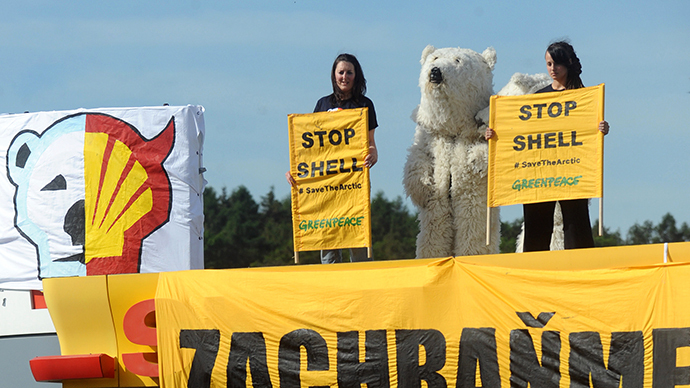 As pipelines get older, the risks increase – but is anything being done to minimize the danger? Arkansas Attorney General Dustin McDaniel has opened an investigation into the spill, asking ExxonMobil to preserve all documents and information related to the accident and ongoing cleanup. Exxon has agreed to “cooperate fully.” The oil giant also says a plan is being developed for the phased return of residents of 22 evacuated homes. “takes the safety of our many pipelines in this country very seriously…and, in cases like these, investigations are undertaken and steps are taken to mitigate the damage and hopefully avoid them in the future.” But the US has a history of pipeline accidents which have led to the deaths of 500 people and injured around 4,000 others since 1986. 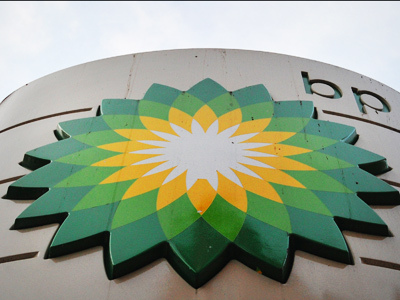 So what is the American government – and oil giants like Exxon - really doing to avoid future tragedies? The Mayflower pipeline was built in the 1940s. While that may seem surprisingly ancient to some, many of the country’s pipelines are of a similar age. “Approximately 3 percent of America’s gas distribution systems are made of cast or wrought iron and were built in the first half of the 20th century; over 12 percent of the nation’s cross-country gas transmission and hazardous liquid pipelines were built prior to the 1950's,” the report added. And as pipelines grow older, the chances of accidents – such as bursts leading to oil spillages – increase. However, there is very little government regulation to keep an eye on corroded pipelines that have simply grown too old to function. The majority of government monitoring and enforcement of pipelines belongs to a small agency within the Department of Transportation, called the Pipeline and Hazardous Materials Safety Administration (PHMSA). The agency only requires that seven per cent of natural gas lines and 44 per cent of hazardous liquid lines be subjected to its strict inspection criteria and inspected regularly. The rest of the pipelines are still inspected, but less often, a PHMSA official told Scientific American in late 2012. It is not clear just how often individual pipelines receive inspections. Meanwhile, some types of pipelines lack any PHMSA regulation at all. A 2012 report from the US Government Accountability Office estimates that of around 230,000 miles of gathering lines - which connect wells to process facilities or larger transmission lines - only 24,000 are federally regulated. Because many of these lines operate at lower pressures and go through remote areas, the government collects no data on ruptures or spills. The report said that Washington has no enforced standards for pipeline strength, welds, or underground depth on the majority of these pipelines. While the Mayflower incident is the most recent pipeline accident in the country, it’s certainly not the first. Last year, there were 364 spills from US pipelines which released about 54,000 barrels of oil and refined products, according to the PHMSA. The latest incident has served as a reminder for critics who believe there are better alternatives to America’s 2.5 million miles of pipelines. “This latest toxic mess is just another reminder that oil companies cannot be trusted to transport toxic tar sands crude through Americans’ backyards, farmlands and watersheds,” Michael Brune, executive director of Sierra Club – a grassroots environmentalist organization - said in a statement. 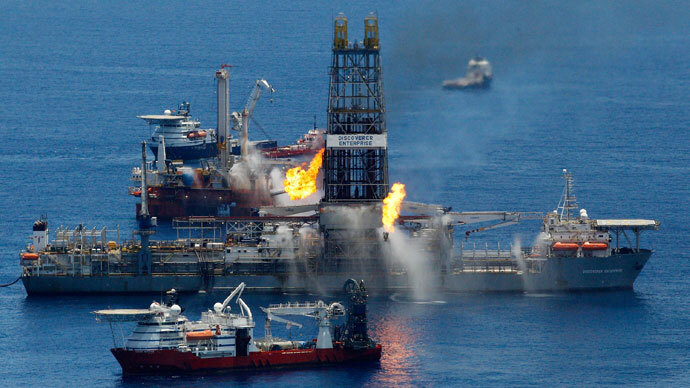 But it’s not the only spill to anger environmental activists in recent years. In July 2011, Exxon's Silvertip pipeline, which carries 40,000 barrels per day of crude in Montana, leaked about 1,500 barrels of oil into the Yellowstone River after heavy flooding in the area. 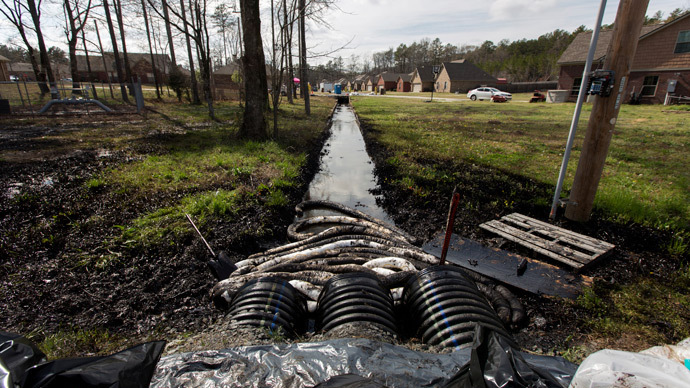 The federal government fined ExxonMobil Corp $1.7 million over pipeline safety violations. One year earlier, a pipeline burst in Kalamazoo, Michigan, sending 877,000 gallons of Canadian crude oil into the Kalamazoo River. The US Environmental Protection Agency later estimated the spill to be in excess of one million gallons. Three years later, the river is still contaminated. Exxon Compensation – will it be enough? 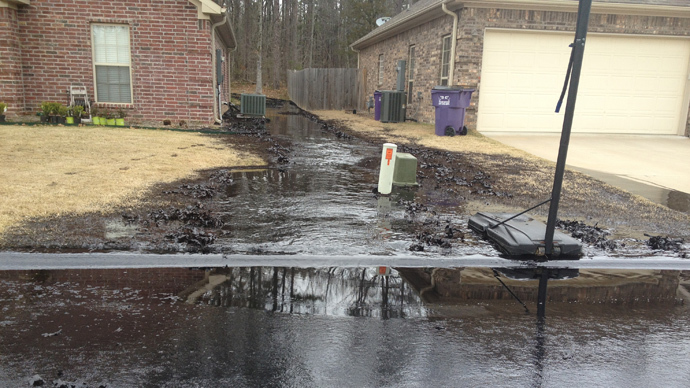 ExxonMobil has also vowed to compensate families whose properties were damaged by the spill. “If you have been harmed by this spill then we’re going to look at how to make that right,” ExxonMobil Pipeline Co. President Gary Pruessing told Mayflower residents evacuated from their homes. According to an official update from the company, Mayflower residents have already filed more than 50 claims for compensation and damages. As those residents wait to hear what the oil giant is willing to offer, many worry about the lasting effects of the situation. “The major concern for many people in our neighborhood is a longer-term impact from the spill, both environmentally and financially. For example, what's this going to do to our property values?” resident Chris Harrell told RT. Many members of the Mayflower community have grown frustrated with the lack of answers being provided by Exxon. “There was a community meeting on Saturday afternoon with some Exxon officials present, and there was a lot of frustration shown at the meeting. Very few answers were given, and the people in attendance were quite angry,” Harrell said. The Mayflower accident has emphasized the growing debate surrounding TransCanada’s Keystone XL Pipeline project, which would see an oil pipeline run across the US Midwest. Environmentalists have expressed concern about the Keystone project since it was proposed four years ago. Even the US State Department admits it will create "numerous" and "substantial" impacts on the environment. In a March draft environmental impact statement, the US said that the Canadian synthetic crude oil the pipeline is slated to transport into the US, produces 17 per cent more greenhouse gases than the natural crude oil already refined there. It also said that the construction phase of the project would result in carbon dioxide emissions equivalent to about 626,000 passenger vehicles operating for one year. The report also said the pipeline could disturb highly erodible soil, degrade streams, encroach on habitats of federally protected species, and be susceptible to potentially disastrous leaks and spills. Despite its obvious environmental toll, the US government still says the Keystone project is better than any other alternatives. However, not everyone is so easily convinced. “The Keystone project is a bad idea for a number of reasons, the climate impact reason and also because pipelines fail. There will be spills, no matter how safe people are in managing them and providing oversight,” environmental consultant Richard Steiner told RT. 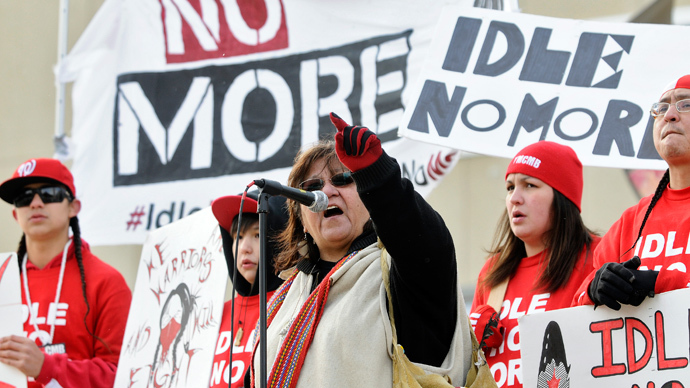 President Obama will have the final say on the pipeline, which has been pending for more than four years, as environmental activists battle to kill it off. Until then, opponents will continue their fight, hoping that Washington will learn from past incidents. “We know from bitter experience that we can’t trust the oil companies to keep up with proper maintenance…so I think this is a recipe for more environmental problems and pipeline leaks,” environmental activist Christopher Williams told RT.